Fears of a possible eruption have been building around Bali’s Mt. Agung, a popular tourist attraction and lure for hikers, for the past two weeks. On Monday, the government expanded an existing “exclusion zone” around the crater to anywhere from 6 kilometers to 7.5 kilometers depending on which side of the mountain you’re on. Residents are on standby to evacuate. If you live in Indonesia, you live with the possibility of potentially dangerous volcanic activity. Situated on the Pacific Ring of Fire, the country is a literal hotspot for natural disasters like earthquakes, tsunamis, and, yes, eruptions. So while we’re very much hoping Mt. Agung just goes back to sleep, we figured it’s as good a time as any to look at some of the archipelago’s most dangerous volcanic blasts of all time. While the volcanoes below are not ranked, we’ve tried to give you a feel for the impact they’ve had based on two categories: 1) the number of lives they’ve cost, and 2) how their eruptions rank on the Volcanic Explosivity Index (VEI), which as its name suggests, measures how explosive eruptions are. The scale, invented in 1982, starts from zero (non-explosive) and is actually open-ended, with eight (mega-colossal explosive) being the highest magnitude recorded so far. Where an eruption falls on the VEI is primarily determined by the volume of pyroclastic material ejected by the volcano (ash, tephra, pyroclastic flows, etc. ), along with factors like the height of the eruption column, and the duration of the eruption. Bali’s Mt. Agung in 1963. Let’s start with Agung, Bali’s highest and holiest peak. The volcano is literally named “Great Mountain” and is known to the Balinese as the “Navel of the World.” The volcano’s last big eruption kicked off in 1963, when after more than 100 years of being dormant, Agung rumbled and smoked starting in February that year, then finally blew its lid in March. The eruption was multi-phase and continued until January 1964. Villages were destroyed and farmland was wrecked, as lava slowly poured down the slopes. More than 1,000 people lost their lives. Amazingly enough, the mother of Balinese temples, Besakih, on the mountain’s southern slopes, remained largely unaffected, which only supported the overriding local belief that the eruption was spiritual. The eruption is said to have shot ash as high as 20 kilometers in the sky and was one of the largest in the 20th century, measuring a five on the VEI. In late August 2010, Sumatra’s Mt. Sinabung erupted for the first time in 410 years. It was quiet again for several more years, then fired off in 2013 and has been one of the country’s most active and dangerous volcanoes since. Located in North Sumatra’s Karo regency, the volcano’s sporadic eruptions in 2014 took the lives of 16 people, while an eruption in May 2016 killed seven. There have been a number of other non-deadly eruptions since 2013, with the most recent eruption recorded just last month. The volcano is under constant monitoring and is currently at a level III, standby alert status. With the high volume of eruptions, villagers in the area have grown accustomed to frequent evacuations — with the largest in Feb. 2014, when as many as 30,000 were evacuated. Ash fall has reportedly had a negative effect on long-term crop growth in the region. Mt. Papandayan at a more peaceful moment. 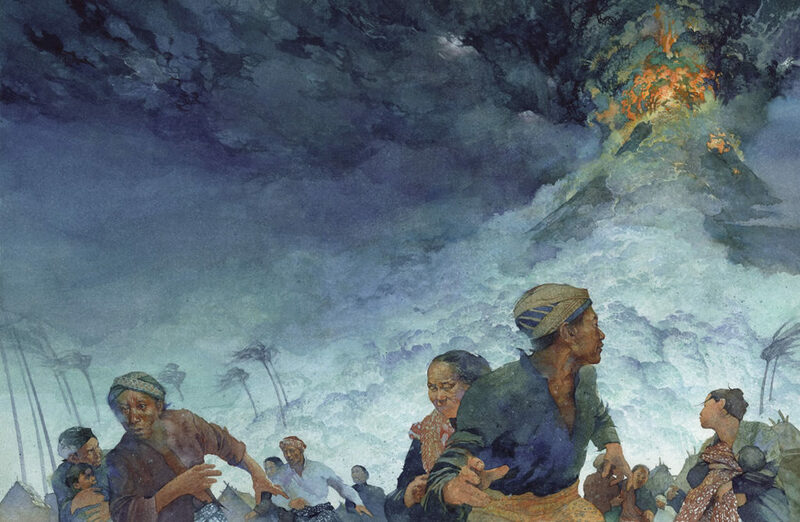 Papandayan’s most devastating eruption on record was in 1772, when a catastrophic debris avalanche wiped out 40 villages and took the lives of about 3,000 people. The eruption of the West Java volcano, measuring as a VEI 3, actually changed the mountain’s shape, with the northeastern flank collapsing, giving the volcano a twin-peak appearance. One peak is called Mt. Papandayan and the other is Mt. Puntang. The volcano’s most recent eruption was mild and ran from 2002 to 2003. Yogyakarta covered in ash spewed out by Mt. Kelud in a 2014 eruption. Mt. Kelud shocked many of us, making international headlines back in 2014 when the East Java volcano spewed ash as high as 17 kilometers in the air. That ash proceeded to travel hundreds of kilometers, blanketing Yogyakarta (a whopping 300 kilometers away) in dust. The eruption killed three and forced the evacuation of approximately 100,000 people. But the volcano has proved itself to be one of Indonesia’s deadliest throughout history, taking an estimated 15,000 lives since the 15th century. Kelud’s most fatal eruption on record was back in 1586, when more than 10,000 of that grim tally were killed by an eruption estimated to be a VEI 4. The volcano is considered especially dangerous for its “lahars,” destructive mud flows. Maninjau left behind one heck of a caldera. The formation of the Maninjau Caldera in West Sumatra was caused by an explosive eruption estimated to have occurred 52,000 years ago. This was one of the largest in recorded volcanic history, measuring an impressive 7 VEI. The caldera runs about 20 kilometers long by eight kilometers wide. Traces of the massive Maninjau eruption can be found near and quite far, with deposits from the eruptions extending up to 50 kilometers east and 75 kilometers to the southeast and west. Galunggung greeted by lightning as the volcano shoots up fire in a 1982 eruption. This West Java volcano entered the scene with a boom in 1822 (its first recorded blast) sending an eruption column soaring up to 24 kilometers high. The VEI 5 eruption wiped out 114 villages, wreaking deadly havoc that claimed 4,011 lives. Galunggung has erupted four times since, most recently in 1982, when it was accompanied by dramatic flashes of lightning. At a VEI 4, the ’82 eruption proved dangerous to sky travelers. A British Airways aircraft that flew into the cloud had engine failure, but the crew was able to restart and divert to Jakarta. Similarly, the next month, a Singapore Airlines flight that flew through the cloud at night had issues, when three out of four of the plane’s engines stopped. Thankfully, the crew was able to land the plane safely. Mt. Merapi, which sits just outside the Javanese city of Yogyakarta, is one of the deadliest and most active volcanoes in the world — and the most active in Indonesia. The mountain’s name literally means “Fire Mountain.” A VEI 3 eruption in 1930 had a death toll of 1,369. More recently, a VEI 4 eruption in 2010 killed 353 people. Part of the reason the volcano has proved so deadly is the sheer amount of people living in close proximity. It’s just about 28 kilometers from Yogyakarta, a city with a sprawling population estimated around 3.5 million, with thousands living in villages on the slope, and some of those within several kilometers from the crater. A lithograph of the eruption circa 1888. August 27, 1883, went down in history when a series of four huge explosions annihilated the volcanic island of Krakatoa. The explosions triggered a giant tsunami that went on to kill nearly 40,000 people. Krakatoa was a major global event, generating what’s believed to be the loudest sound ever heard in modern history. The island’s explosive destruction could be heard all the way from India to Australia and the pressure barograph reading of the final blast showed that sound wave traveled around the globe three and a half times. Krakatoa also had an impact on global weather patterns, with average global temperatures falling as much as 1.2 degree Celsius in the year after the eruption thanks to the immense amount of ash thrown into the atmosphere. Weather didn’t even stabilize until 1888. In 1928, Anak Krakatoa — a new volcano — peeked out from the water, was covered up, then reemerged in 1929. The volcano, named “Child of Krakatoa” has been growing ever since and has remained highly active. Painting by Greg Harlin Wood Ronsaville Harlin, Inc. While Krakatoa is one of the world’s most famous volcanoes, Tambora’s 1815 eruption was bigger and deadlier. As one of the most powerful volcanic eruptions in world history, measuring a 7 VEI, the Sumbawa volcano killed an estimated 71,000 people. That number is said to be even higher if indirect deaths are included, like those who starved from crop failure. As with Krakatoa, Tambora had a serious impact on global weather patterns, because of the sheer amount of sulphur dioxide thrown up into the stratosphere during the eruption. Tambora’s eruption even lead to the infamous “Year without a Summer” in 1816. An ancestral volcano to Mt. Rinjani in Lombok, Samalas exploded in 1257, hitting a whopping 7 on the VEI, but the volcano is lesser known than Krakatoa and Tambora because it wasn’t conclusively identified as the source of the mega-eruption that most likely triggered the Little Ice Age until only several years ago. The volcano’s 1257 explosion is now understood to be the greatest stratospheric gas release of the common era. The Toba supervolcano erupted around 75,000 years ago, making for one of the most explosive volcanic events on Earth. As in mega-colossal explosive. The VEI 8 eruption—the only one in Indonesia to date—is at least thought to be the largest on the planet in the past 2.5 million years. In a series of eruptions, Toba sent out around 700 cubic meters of magma, while in comparison, Krakatoa just blasted out three cubic meters in its 1883 explosion. How’s that for size? While paleontologists had thought the volcano sent Earth into a volcanic winter, pushing us to the brink of extinction, recent research suggests the contrary, that East Africa where humans dwelled wasn’t so much affected. The next super-eruption isn’t predicted to occur for thousands of years—even hundreds of thousands years.